To activate the 17 percent discount on each of the following paperback Career Books, use this TALK the WALK Discount Code: KRG3Y2HCX. Preview Career Book 1's Chapter 4, "Manage Motivation." 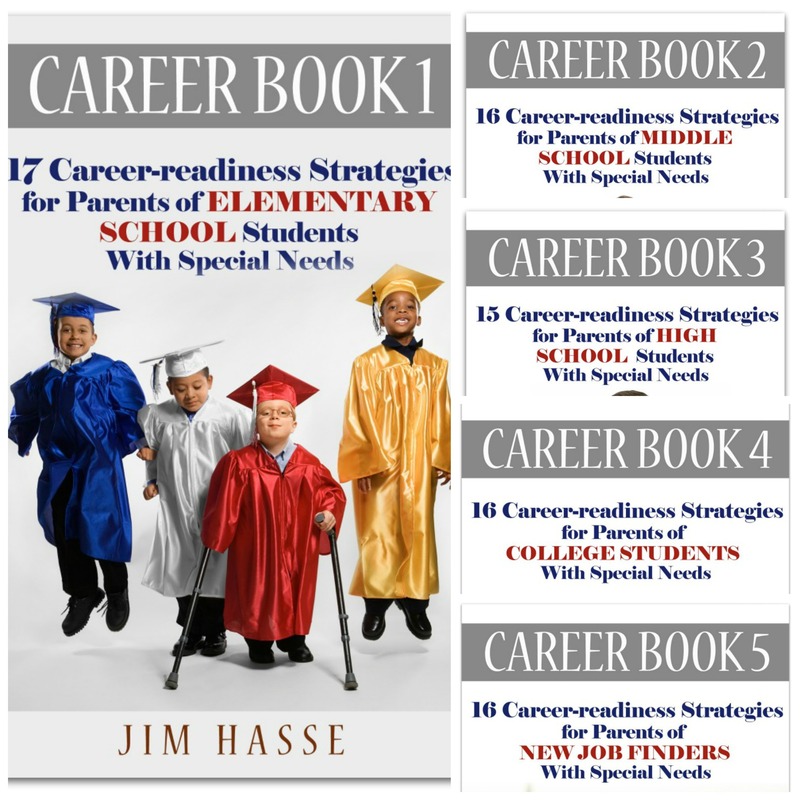 Collage of 5 "career readiness" paperback books by Jim Hasse. Here's why you need to read these paperback books about how to help your youngster with a disability become career ready. They show how leveraging disability worked for me in the mainstream job market (even though I walked and talked with difficulty due to CP) and how preparation for my career started in elementary school. For me, each book's career-readiness strategies were a confidence boosters throughout my school years. Now is the time to help your youngster with special needs begin to think about how to tap disability's edge in tomorrow's job market. Here are Career Book 1's time-tested strategies which now, decades later, may help you coach your youngster while in elementary school. ... You can empower your youngster by providing a home life (or frequent place to visit, if your situation is not home-based) which is, in itself, a career builder. It’s a career builder because it fosters self-esteem development -- a place where managing your personal feelings is the norm. In such an environment, individuals relate to one another at a high level of consciousness, self-acceptance (and acceptance of others), self-responsibility, self-assertiveness (and respect for the assertiveness of others), purposefulness, and personal integrity. Feel accepted and treated with courtesy; that means being listened to, invited to express thoughts and feelings, and being dealt with as an individual whose dignity is important. Feel challenge by learning new things which excite, inspire, test and stretch both ability and imagination. Feel recognized, acknowledged for personal talents and achievements which are based on reality instead of paternalism. Receive constructive, unfettered feedback as a means for improving performance in non-demeaning ways that stress positives instead of negatives and that concentrate on building up personal strengths. See that innovation can be exciting, and, as a result, personal opinions are solicited and valued. Gain easy access to information and resources about careers and about what makes work valuable and personally rewarding both from an abstract and general standpoint as well from the perspective of family members and friends. Gain appropriate authority to take initiative, make decisions, and exercise judgment in school matters which involve career development and vocational training. Live under clear-cut and non-contradictory rules and guidelines which provide a structure so he or she knows what the family expects from its each of its members on a day-to-day basis. Feel empowered to solve as many problems as possible on a personal basis instead of passing responsibility for solutions to other family members. See the rewards for success are far greater than any downside for failure so that appropriate risk taking becomes a family norm. Learn and be rewarded for learning that expands knowledge and skills. Experience congruence between values and actions within the family, so, as integrity is exemplified by each member, there is a motivation to match what all family members see in each other. Experience being treated fairly and justly so that the family becomes a rational, trustworthy unit for everyone involved. Perceive that personal work done within the family is genuinely useful and worth doing. Save $4.95. Use Discount Code RG3Y2HCX to order all five Career Books now at a 17 percent discount.